The loom works, and she’s officially Mabel. I don’t know why, but Mabel seems like a good name for this loom. I think it’s because it’s clunky and ungraceful but very ingeniously designed, and perfect for its purpose — she isn’t pretty, but she’s dependable and gets the job done. Above is a picture of my first project with about 1 inch of actual project woven — the pink is waste to get the warp (the longwise threads) lined up evenly and this is necessary on every project. Some looms have more waste than others; my Macomber (which doesn’t have a name) only has a total of about a 10 inches of loom waste; I have a feeling this loom will be more like the standard one yard that all the weavers I know calculate into their projects. This thread I got at the Spinner’s and Weaver’s Guild annual silent auction, and I’m ecstatic that I can use something that cost next to nothing to get to know all the bugs and problems with Mabel before I commit expensive materials or handspun to her. I can already tell I’m going to need a different reed (or two) as the threads are getting fuzzy, which means that they are rubbing. I had to clean some rust off the reed while I was cleaning up the rest of it; this reed is old enough that it’s not stainless steel, which means it’s susceptible to rust and corrosion even in the desert. The corrosion is a problem because it makes the dents, or slots the warp passes through, rough, which rubs it and makes it quite likely it will break at some point before I’m finished. This is good to know as I can plan for the expense of a stainless steel reed which will eliminate the rust/corrosion problem and the rubbing problem. This second picture is of the loom with the warp wound on. 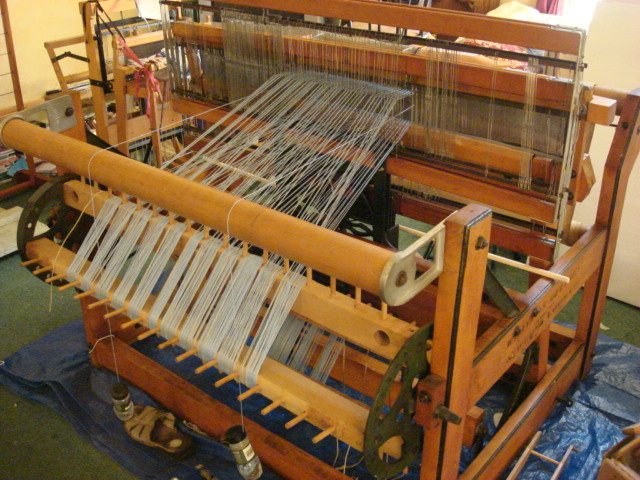 This loom has a sectional warping beam, which explains the pegs you see. Each peg is spaced 2″ from the next; it keeps the warp nicely divided into 2 inch sections (hence sectional warping) which makes warping on, once you get the hang of it, a very nice change from warping on with a warping board and keeping the ‘cross’ and using lease sticks to maintain the ‘cross’ (which helps you keep the threads in the proper order for weaving without threads crossing over themselves and making your weaving all wrong). It doesn’t take any less time, but it does make it more organized. The spice jars hanging down have quarters in them to weight them; they hold the floating selvage threads which are very important in maintaining the edge when weaving. They aren’t through anything except a blank space in the reed, so they are always in the same horizontal position. This keeps the edge neat; otherwise, with many weaving patterns the edge won’t be neat at all and many threads won’t even get woven for several passes because of how the pattern goes. The selvage threads are woven every time the shuttle passes and keep the integrity of the edge. I have to manually advance the warp in them every so often by opening the flip top and pulling out more thread. My cat was fascinated originally by them but they hurt when he batted them and they swung back in his face, so he leaves them alone now. One BIG problem with this loom is the fact that the beater bar is warped. More specifically, the anchor beam that holds the base of the beater bar is warped. I’m trying to figure out a way to overcome this because 2 inches is a big deal and in order for me to get my beat even, I have to pack the weft (the thread that weaves through the warp) in so tightly that that’s really all you can see. Now, for some things this would be great, but I don’t want that now. I bought a bunch of washers and placed some on the warped side hoping it would help, which it did a little, but not enough. I’m now thinking I might need to put some on the other side, on the opposite part of the beam, to push the ‘good’ side back a little. DH says just take the warped board off and file it until it matches up better, but given it takes a LOT of stress I’m hesitant to do that. My Black and Decker cordless drill has been getting quite the workout for this project as well! It has turned into a spool winder. I slide the spools on over the screwdriver attachment, and I can wind yarn on my spools in nothing flat! Which is a LOT nicer than doing it by hand, and a LOT LOT nicer than buying a commercial spool winder! On the spinning front, I’m nearly done spinning up the merino/alpaca blend I carded up a few months ago (statistics class interfered with life) and I’m going to try my hand at Navajo plying. If it works, and I’m happy with it, I may use this method of plying as an alternative to regular plying; I am NOT a good plyer because I don’t spin evenly, and I have to stop and check that my twist is neutral very, very frequently. Anything that speeds up the process is a good thing. The grapes are ripe, I still have half a case of blueberries in the freezer to put up, and I’m getting 20 lbs of organic apples from a local orchard this week. I’m going to be busy…. Hi, just a note. Your warp threads are supposed go UP OVER the back beam too. Right alongside your floating selvedges. Could be why you’re getting fuzzing. Too much stress on the warp. Yes, I know. I probably didn’t blog about it but I did have quite the story to tell my guild members at the next meeting. I cut it and took it up where it belonged, and finished the towels. Of course, when I cut it I managed to leave a 1 inch grouping out so it was an inch narrower than I had planned. Those towels are skinny but they are still being used – though the loom is in pieces on the porch of a friend that I gave it to. Wow, I just got sold my Weaver’s delight loom. 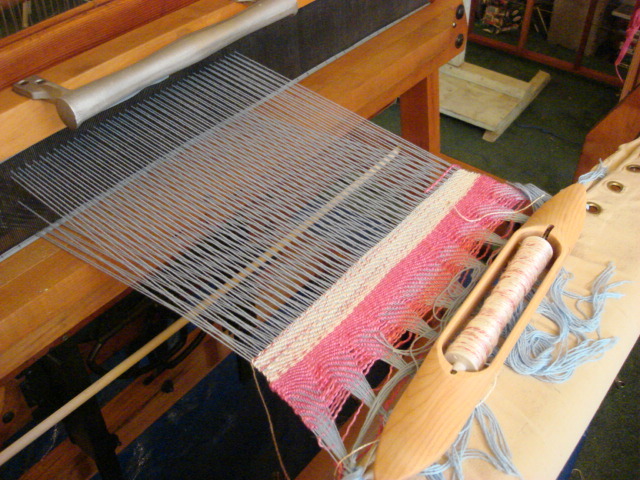 It is a good loom, made primarily for rugs, but other things can be woven on it. They are sturdy and heavy. Mine was named GUS. A woman in Michigan has offered him a new home and is very happy with it. Weaver’s Delights are weaving “machines”, not just looms. They are ingenious and dependable but also very heavy. Not made for an upstairs room where mine lived. I did make several rugs and placemats on Gus. They turned out good. Sectional warping is rather nice once you do it.